The concept of economies of scale can be one of the most valuable ingredients to bringing down your cost structure as you scale up your innovation idea. Economies of scale are an accepted concept that makes common sense – so, why bother writing anything about it? Because the journey of scaling up (and benefiting from economies of scale) will, in reality, be very different from what you learn in the economics textbook. Today, I am going to use Netflix as an in-depth, real-life example to demonstrate the challenges on their innovation journey as they have grown over the years. You will also learn how Netflix transformed from a DVD-mailing company to an envied tech powerhouse. Let’s have a brief look at how real-life economies of scale (EoS) can differ from the textbook. Economies of scale unfold differently in a real-world setting than in an economic setting where you are backwards looking and over a long period of time and accounting differently. Especially in the case of smaller firms or start-ups, things will look more like scenarios B and C above. This can take you by surprise if you trust the textbook curve too much. 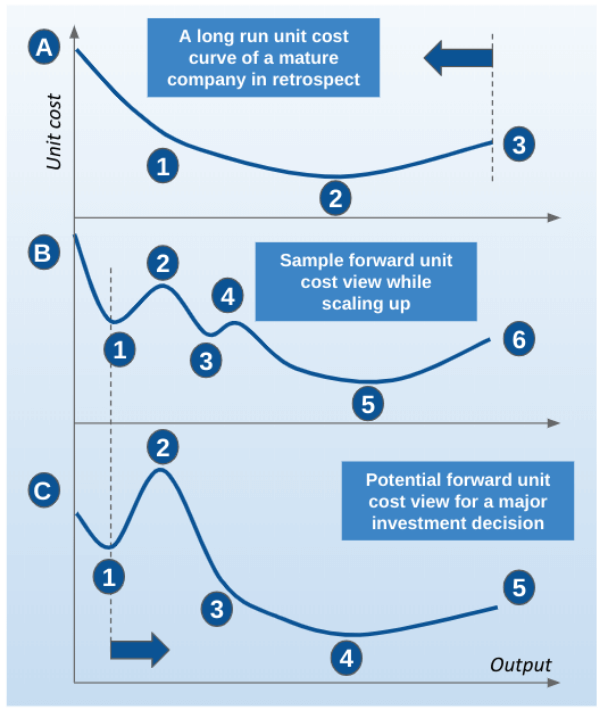 Unit cost reductions can come from ongoing optimisation efforts related to scaling up. In other cases, they may also require capex (or one-off opex) to be invested to achieve these lower unit cost levels. 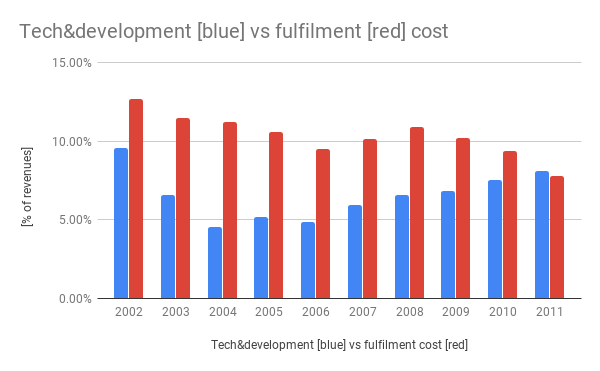 When Netflix went to streaming they reduced their fulfilment cost but had to first invest into technology and development for a number of years. 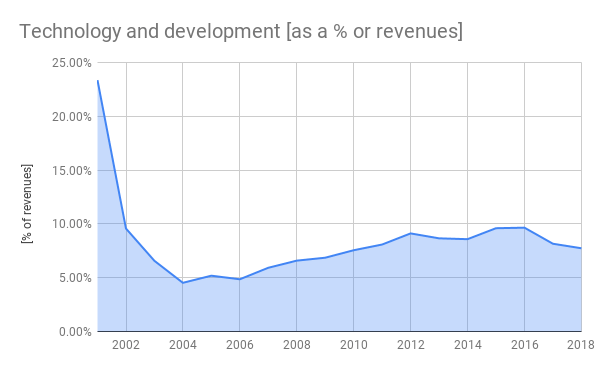 Let’s now look at Netflix 20-year journey from an economies of scale perspective (we will be looking at Netflix through a number of other lenses throughout my next new articles). 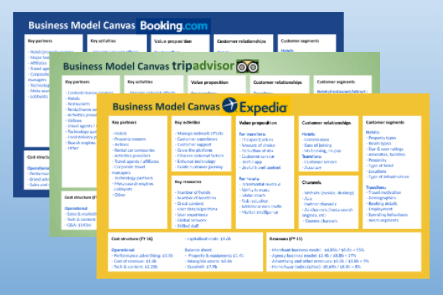 Annual report, 2007: Scalable Business Model. We believe that we have a scalable, low-cost business model designed to maximize our revenues and minimize our costs. As we continue to expand our subscriber base, we are able to leverage operational changes in a cost effective manner which further reduces our operating costs on a per subscriber basis. Such cost reductions include increased automation and vendor negotiating leverage. Instead of using operating cost on a per subscriber basis I have decided to use the individual cost components as a percentage of revenues. 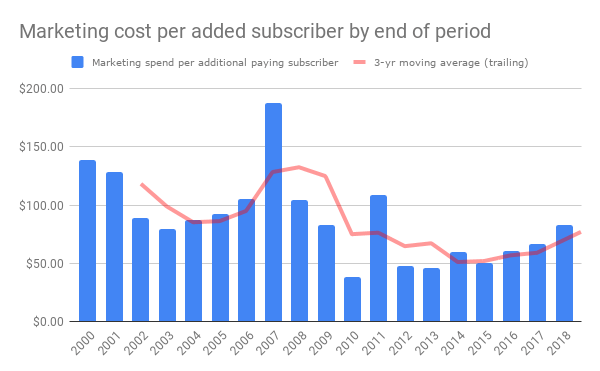 I consider this better as it also accounts for the churn of subscribers during each annual period (whereas unit cost per subscribers at year-end omits this, it also weeds out the free-trial subscribers that may never lead to any revenues). Another company that heavily relies on scale is Amazon. 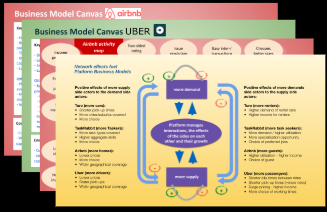 Download the summary report on Amazon’s business models in pdf: Some 75 pages formatted for easy readability and printability. You will get an email notification of new articles (roughly once a month, no spam ever, plus unsubscribe anytime). You may have forgotten it but in the early days (founded in 1997) Netflix was a mailing company that would mail millions of DVDs per day to their customers delivered by US Postal Service. Annual report 2002, pg F-10 Fulfillment costs represent those costs incurred in operating and staffing the Company’s fulfillment and customer service centers, including costs attributable to receiving, inspecting and warehousing the Company’s DVD library. Fulfillment costs also include credit card fees. “We currently stock more than 14,500 titles on more than 5.1 million DVDs. During December 2002, we shipped to and received from subscribers more than 9.7 million DVDs. We currently are operating 18 shipping centers serving the metropolitan areas of Atlanta, Boston, Dallas, Denver, Detroit, Houston, Los Angeles, Miami, Minneapolis, New York, Newark, Philadelphia, Phoenix, Portland, San Francisco, Stamford, Seattle and Washington, DC. We plan to open additional shipping centers in 2003. We estimate the set-up cost of a shipping center to be approximately $60,000. By 2004, Netflix has 30 shipping centres in 2004 and it is the last time they call out the number of fulfilment centres. 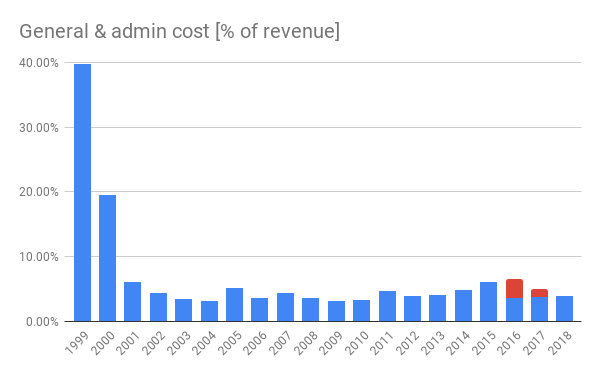 I have pulled out the fulfilment cost as a percentage of revenues over the first 10 years. The effects of economies of scale can be well seen. 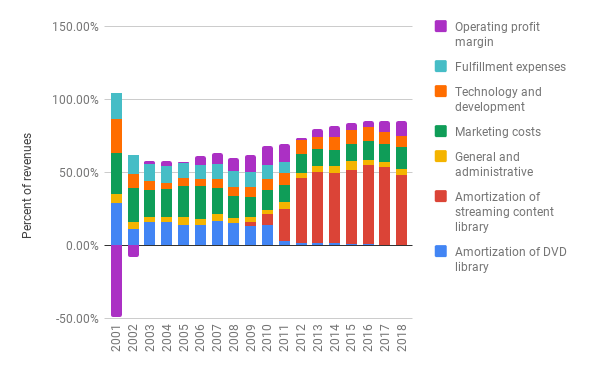 Further, with declining fulfilment costs per revenue, more funds are left for investment, marketing and other activities that can increase future revenues. It wasn’t the first time that Netflix had evaluated an internet-only option, but only in the mid-2000s did data speeds and bandwidth costs finally reach the point where asking users to download an entire movie online no longer seemed like a crazy idea. The initial thinking was that we would create and supply customers with a “Netflix box” that they could use to download movies overnight to watch the next day. It was incredibly difficult to acquire the download rights to movies, just as it was difficult to create the new box and service, but by 2005, we were finally ready to launch. That pivot took two long years, during which we had to renegotiate all our rights and build an entirely new architecture to host and serve content. We had to transform our “Netflix box” from a hard drive that would download video to one that would stream it. The acquisition of content is the biggest cost to Netflix in most years. Once streaming commences, these costs go up dramatically. And I am not sure if this was expected to the extent it happened. This makes it an interesting point for us as innovators. Let’s look at the sourcing of the DVD library and the cost of content acquisition (in their own words). Annual report, 2002, pg F-7 “Historically, the Company purchased DVDs from studios and distributors. Annual report, 2002, “In 2000 and 2001, the Company entered into a series of revenue sharing agreements with several studios which changed the business model for acquiring DVDs and satisfying subscriber demand. These revenue sharing agreements enable the Company to obtain DVDs at a lower up front cost than under traditional buying arrangements. Netflix calls the revenue sharing model an important part of their business model prior to streaming. Once streaming goes live things change rather quickly. 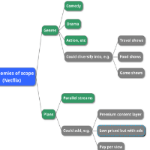 Streaming content library: Unintended side effects? Streaming goes live in 2007 with only a very small selection of titles (1,000 streaming titles compared to 100,000 DVD titles). As streaming becomes more popular, more titles get added and costs increase rapidly. 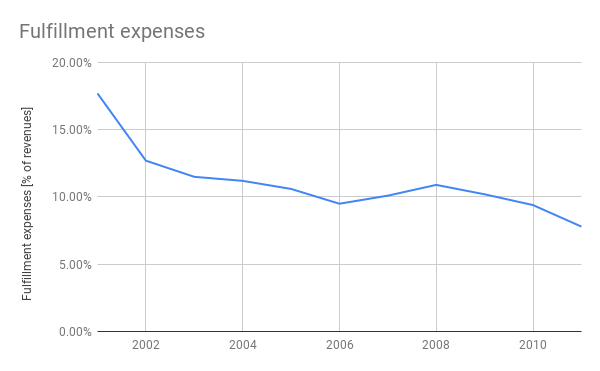 By looking at their overall profit margins, I assume that the cost increase was not expected to this extent. 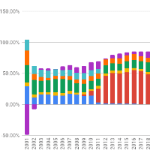 In 2012 the operating profit falls to 1.48% from low double digits in the preceding 3 years and from high single digits in the 3 years prior to that. In the first years after streaming started, Netflix had to negotiate carefully (and with a big check book) to get rights to stream some of the more popular shows (you can get an insight about that situation at the time in this article from 2010). Looking at the above chart, we see a curve emerging as shown in scenario C in our economies of scale journeys. We see a tapering the latest data and it will be interesting to follow the next few years. The ability to reduce content costs will depend on a number of factors (not just economies of scale) but also the industry structure. Content providers (studios, etc) will try to get as much as possible and this will put a floor to Netflix’ scaling effort (and therefore I don’t expect a massive tapering as in point 3 of scenario C). We must continue to build and maintain strong brand identity. We believe that strong brand identity will be important in attracting and retaining members who have a number of choices from which to obtain entertainment video. To build a strong brand we believe we must continue to offer content and service features that our members value and enjoy. We also believe that these must be coupled with effective consumer communications, such as marketing, customer service and public relations. If our efforts to promote and maintain our brand are not successful, our ability to attract and retain members may be adversely affected. Such a result, coupled with the increasingly long-term and fixed cost nature of our content acquisition licenses, may adversely affect our operating results. With respect to our expansion into international markets, we will also need to establish our brand and to the extent we are not successful, our business in new markets may be adversely impacted. This gives us a pretty good picture of the content cost, customer experience, the Netflix brand and their margins. Economies of scale and scaling up also have non-linear effects. Once you grow beyond a certain size new opportunities arise. Own content reduces their dependency to studios somewhat and this could lead to a shift of powers within the wider industry (esp if others, like Amazon, continue creating their own originals as well). Original content helps to build their brand and avoids them being a pure content distribution company. It increases also the barriers of entry for new entrants. This philosophy has remained the same from those early days of streaming. I will cover the concept of contribution margins in a separate article in the near future using Netflix’ example as this is a very important concept. With this, you have gained excellent understanding of Netflix’ content cost. It is one of the most fundamental parts of its business. We not regurgitating theoretical content that you can find on a dozen other webpages. 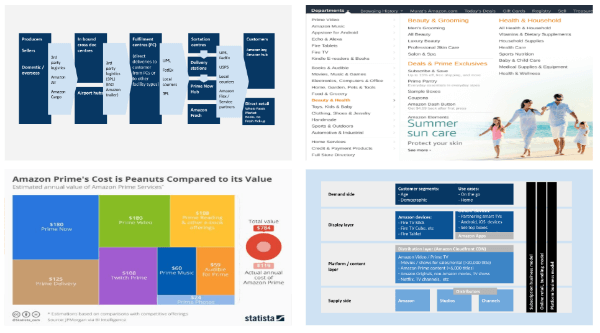 We are giving you the real deal – stuff that will help you on your innovation journey! Sometimes overlooked is the fact that you can also achieve economies of scale in the area of marketing. It is another crucial ingredient to Netflix’ success. The growth rates that Netflix has achieved would not be possible without extensive marketing. And that is important because – as we are clear by now – growth is what is fuelling economies of scale. I will cover the topic of customer acquisition and retention (and the outliers below) in more depth in an article in the near future using Netflix as an example. One of Adam Smith’ key insights was an increase in productivity due to specialisation and the division of labour. There are economies of scale to be gained through specialisation of individuals and organisations within the firm. Decisions to in or outsource are crucial in this discussion. Specialisation often is seen in in- and out-sourcing decisions. Take the example of what has become the Roku player. From the early 2000s, Netflix started working on a “Netflix box” that would download movies over the internet overnight for people to watch. In 2005, Netflix decided to go the path of streaming rather than the Netflix box. In 2008 after streaming went live, Netflix outsourced the Roku player (as it was called then) by spinning out Roku Inc (and remaining a large shareholder of it). Roku now creates streaming set-top-boxes for Netflix and other streaming content. It shows that Netflix did not want to divert attention and keep focused/specialised on what they are known for: content. General and administrative expenses increased primarily due to a $184.7 million increase in personnel-related costs, including stock-based compensation expense, resulting from a 56% increase in average headcount primarily to support our international expansion and increased production of original content, and an increase in compensation for existing employees. 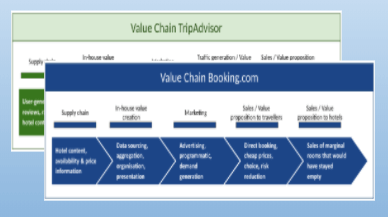 On pg 4 of the same report, you can see that this is seen as a differentiating customer value proposition that plays a role in attracting and retaining subscribers. We believe that original programming can help differentiate our service from other offerings, enhance our brand and otherwise attract and retain members. It also helps in negotiating better terms with studios on obtaining exclusive rights from them due to the fact that they have the alternative option to invest more in creating originals themselves if the studios offer overly unfavourable terms (a simple insight from Porter’s Five Forces). In 2010, Netflix was just another bidder among many to compete for content rights. With scale they have gained clout. Marketing plays a key role in Netflix’ growth which is why they have built internal capability over the years. 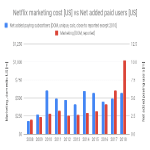 In the latest annual report (2018), Netflix reclassified costs that were previously captured as general and admin into marketing. This has provided some insight into these specialised costs (though only for the years 2016, 2017). You see these split out below. “Netflix is a global internet entertainment services network offering movies and TV series commercial-free, with unlimited viewing on any internet-connected screen for an affordable, no-commitment monthly fee. Netflix is a focused passion brand, not a do-everything brand: Starbucks, not 7-Eleven; Southwest, not United; HBO, not Dish. 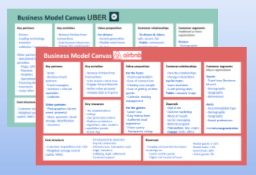 What are the areas that your innovation needs to focus on and scale up? What are the economies of scale that you can leverage as you scale those? Let’s now look at one example for external economies of scale. I am choosing network effects as one example but there are more. I will cover things like agglomeration next time. One of the most important external EoS in Netflix’ history was the rapid spreading of DVD players from 2002 onwards. This lead to a reduction of prices of players and DVDs which both greatly contributed to a larger customer base as well as a lower cost base (e.g. lower DVD prices) to benefit Netflix. Another, much larger network effect was that of the expansion of the internet and in particular, steadily increasing bandwidth and penetration across large parts of the population. This was the enabler of the success of streaming! Our membership growth exhibits a seasonal pattern that reflects variations when consumers buy internet-connected screens and when they tend to increase their viewing. Historically, the first and fourth quarters (October through March) represent our greatest membership growth across our Domestic and International streaming segments. As you can see economies of scale don’t only come from internal sources. We all know intuitively that economies of scale are an important concept that can help innovators bring down their unit cost structure as they scale up. But you have also seen that it’s just a bit more tricky than the nicely sloping down textbook curve. As things don’t play out as described in the textbook it is important to not get discouraged! And I hope you have enjoyed Netflix’ innovation journey described from an economies of scale perspective and learned a lot! One of the most crucial metrics that Netflix keeps an eye on is the contribution margin. They use it for their most important decision: how much to invest in content year-on-year. Understand how to use this revealing metric for your own innovations. One of your most important advantages as a first or early mover will be to benefit from economies of scale as to create barriers of entry for second/late movers, e.g. 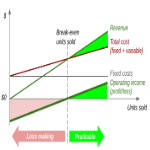 by being able to price your product lower due to lower unit cost as a result of economies of scale. Scaling up can give you major cost and competitive advantages compared to others that will try to do the same if you are able to harvest economies of scale. 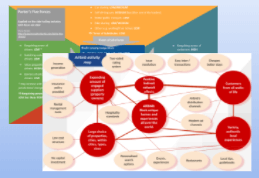 When done right, you can also benefit from economies of scope, density and agglomeration. On the flip side, you may fall into the trap of diseconomies of scale. Learn about these additional opportunities and risks related to scaling up while at the same time improving your knowledge about Netflix.